The World Day to Combat Desertification and Drought is observed every year to promote public awareness of international efforts to combat desertification. This year the World Day to Combat Desertification and Drought examine the important link between land degradation and migration. Trinidad and Tobago ranks last because it hardly relies on any green energy sources. Mozambique tops the list as the most green nation because it uses 100% green energy. Marathi actor Sai Tamhankar will be awarded the 'Face of the Year' award while veteran actor Sachin Pilgaonkar will be honoured with the 'Krutadnyata award'. Nagesh Bhosle's Sanchar, and Girish Joshi's Take Care, Good Night will premiere at the festival. Marathi films like Ventilator, Muramba, Oli ki Suki, Chi va Chi Sau Ka, Disha, Kasav will be screened over next three days. Mahesh Manjrekar's F.U. will also have two shows during the festival. The conference will deliberate on themes such as 'North East and Look East Policy', 'Special plan for development of railways and airways for speedy economic development of North East region', and 'Setting up of a chapter of Speaker's Research Initiative (SRI) in the region'. It will be held at the assembly premises here till June 18. The SRI has conducted several meetings and workshops with stakeholders in democracy and eminent domain experts for members of Parliament during sessions, specifically on subjects listed before Parliament. 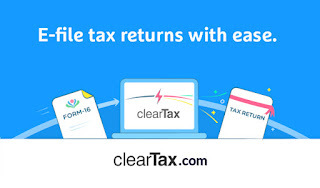 To help small and medium businesses (SMEs) in the country get GST-ready, ClearTax, has launched a Bill book software. ClearTax's GST Bill Book is a free software platform for preparing GST-compliant invoices. With this platform for small businesses in India, ClearTax plans to reach out to about 10 lakh SMEs across the country. The GST bill book supports features such as creating a sales invoice, recording of discount, freight, insurance, & package handling charges. In addition to creating sales bills, it can be used to record purchases and expenses under GST regime. It will also support other documents mandated by GST such as delivery challan, e-way bill, advance payment receipts etc. ClearTax was founded by Archit Gupta along with his father Raja Ram Gupta, Srivatsan Chari, and Ankit Solanki. ClearTax is Y-Combinator's first India focused investment. 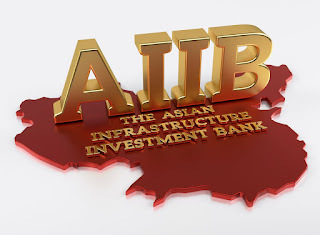 Indian Finance Minister Arun Jaitley noted that his country would be honoured to become the host country for the third AIIB annual meeting. The first annual meeting was held in Beijing last year. The second meeting, which would last for two days was launched in South Korea's southern resort island of Jeju. India’s current account deficit (CAD) narrowed during last fiscal due to a contraction in the country’s trade deficit. 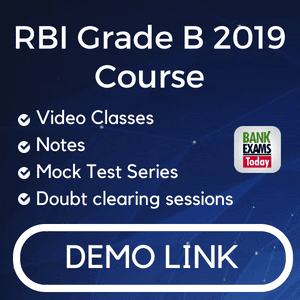 According to data furnished by the Reserve Bank of India (RBI), the CAD for last fiscal narrowed to 0.7 per cent of the GDP from 1.1 per cent in 2015-16 on the back of the contraction in trade deficit. India’s trade deficit during the fiscal under review narrowed to $112.4 billion in 2016-17 from $130.1 billion in 2015-16. 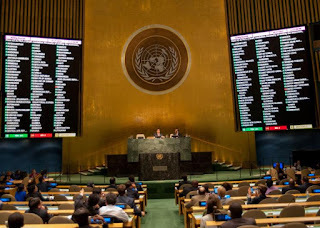 The UN General Assembly has approved the establishment of a new office to coordinate counter-terrorism efforts, a move welcomed by India as a "much awaited first step" that will align the world body with needs of the global community in the fight against the menace. 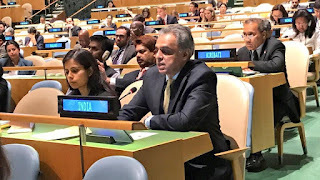 India welcomed the creation of the new UN counter-terrorism office, saying it demonstrates the importance member states place on collective and coordinated action on terrorism, which remains the most complex threat faced by the international community. The main functions of the new office would include enhancing coordination and coherence across the 38 Counter-Terrorism Implementation Task Force entities, strengthening the delivery of UN counter-terrorism capacity-building assistance to Member States, improving visibility, advocacy and resource mobilization for UN counter-terrorism efforts and ensuring that due priority is given to counterterrorism across the United Nations system and that the important work on preventing violent extremism is firmly rooted in the strategy. India was among 18 nations to win election to the Economic and Social Council (ECOSOC). India obtained 183 votes, the second highest after Japan in the Asia Pacific category. Pakistan, whose term on the Council is expiring this year, was seeking re-election to the UN body but lost as it got only one vote. ECOSOC, one of the six main organs of the United Nations, is the principal body for coordination, policy review, policy dialogue and recommendations on economic, social and environmental issues, as well as for implementation of the internationally agreed development goals. The area, home to six of China's 10 smoggiest cities in the first quarter of this year, has promised to upgrade or shut vast swathes of polluting industry as it tries to meet 2017 air quality targets. 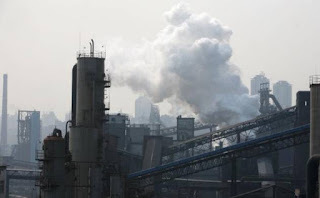 But financing the transition to cleaner energy has proved one of its biggest challenges, especially in poorer rural regions of Hebei, where the switch from coal to natural gas is expected to cost at least 300 billion yuan ($44.04 billion) over the 2016-2020 period. 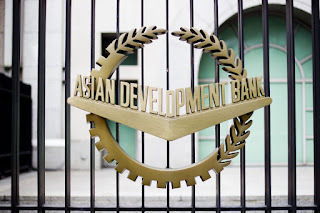 The financing platform was launched by the ADB and the China National Investment and Guaranty Corporation (I&G), the State Development and Investment Corporation (SDIC), as well as China's finance ministry and National Development and Reform Commission. 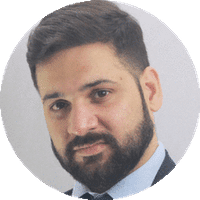 The bank late last year approved a loan of 458 million euros ($510.58 million) for the platform, which it says will leverage 3.6 billion euros in domestic commercial financing. These services utilise a customer’s Aadhaar number, eye scan and fingerprint impression. The DCB ATM also can be used with the usual ATM/ Debit Card. 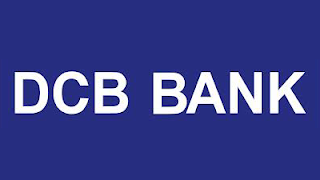 DCB Bank branches in Telangana provide a range of banking products for farmers, agri-business, micro business, small business and individuals. The Bank provides loans for tractors, dairy, crop, land development, agri processing activities as well as for high-tech farming such as greenhouses. More significantly, not only Aadhaar has been mandatory for opening new accounts but also for carrying out high-value transactions. The government has said that transactions worth Rs 50,000 or more will now require Aadhaar number. This is similar to how PAN number was required for high-value transactions. But now instead of PAN, consumers will have to quote Aaadhar number. 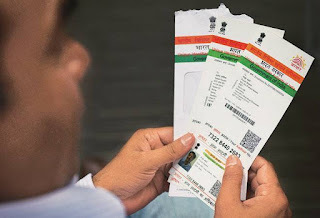 The government move to link all bank accounts with Aadhaar number comes days after the Supreme Court partially struck down the government proposal to make Aadhaar mandatory for filing of tax returns. 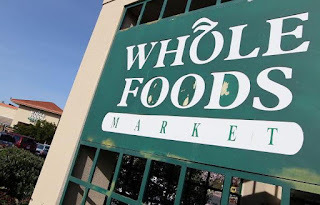 Amazon and Whole Foods Market, Inc. announced that they have entered into a definitive merger agreement under which Amazon will acquire Whole Foods Market for $42 per share in an all-cash transaction valued at approximately $13.7 billion, including Whole Foods Market’s net debt. Completion of the transaction is subject to approval by Whole Foods Market's shareholders, regulatory approvals and other customary closing conditions. 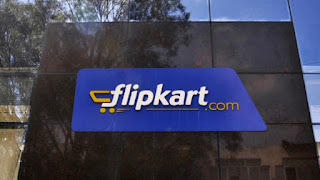 E-commerce major Flipkart's proposed acquisition of eBay India has received approval from the Competition Commission. Besides, the fair trade regulator has given nod to eBay Singapore's subscription of compulsorily convertible preference shares (CCPS) issued by Flipkart. eBay will invest $500 million in Flipkart as the two firms will merge their operations in the country. As part of the deal, Flipkart will own and operate eBay's business in India. 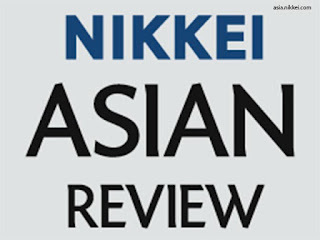 20 Indian firms have been named in the top 100 of Nikkei Asian Review's Asia300 companies list, which was topped by taiwan's Largan Precision. Indian IT service provider HCL Technologies came in at the second place, followed by Zee Entertainment Enterprises and Tata Consultancy Services at the third and fourth place respectively. Others in the top ten include, Taiwan Semiconductor Manufacturing Co at the 5th position, Alibaba Group Holding (6th), ECLAT TEXTILE (7th), Vietnam Dairy Products (VINAMILK) (8th), Tencent Holdings, (9th) and Airports of thailand at the 10th place. Other Indian companies named among top 100 include Sun Pharmaceutical Industries at the 11th place, infosys (15), ITC (16), MARUTI SUZUKI INDIA (17), Lupin (18), Dabur India (24), Asian Paints (28), Power Grid Corporation of India (40), Godrej Consumer Products (41), Bajaj Auto (43), Wipro (48), Hero MotoCorp (57), Hindustan unilever (62), Housing Development Finance Corp (71), Motherson Sumi Systems (72) and Vedanta at 93rd place. India gained a spot in the latest ICC ODI rankings, climbing up to second with 118 points while Virat Kohli retained the top spot in ODI Player rankings for batsmen. Australia are third on the table with 117 points while England are fourth with 113. Despite playing a long home season of Test cricket, India's rise in ODI rankings can be attributed to their series victories over New Zealand and England as well as their performance in the ICC Champions Trophy. Virat Kohli consistent display in the ongoing Champions Trophy helped him stay on top of the rankings for bastmen. 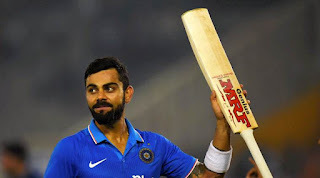 After scoring an 81 not out against Pakistan in the tournament opener, Kohli got out on a rare duck in the match against Sri Lanka. The Indian captain came back with renewed vigour against South Africa hitting 76 not out at a strike rate of 75.25. Kohli was at his fluent best against Bangladesh on Thursday where he scored 96 not out and hit the winning four. Indian captain Virat Kohli created a world record in the semi-final of the ICC Champions Trophy 2017 against Bangladesh as he became the fastest batsman to reach 8,000 ODI runs. The 28-year-old batsman got to the milestone in just 175 innings (183 matches) and in the process broke the record that was previously held by South African ODI captain AB de Villiers. The Indian batsman also became just the second batsman to have scored 8,000 ODI runs in under 200 innings after AB de Villiers, who took 182 innings to get to the milestone. The record was held by Sourav Ganguly for 13 years before AB de Villiers broke it against New Zealand in 2015 but the Proteas batsman’s record lasted less than two years as it was broken by his Royal Challengers Bangalore teammate. Having lost the world record for the fastest to 7,000 ODI runs to Hashim Amla, Kohl has stepped on the accelerator in the Champions Trophy where he has scored three fifties in the four matches he has played. Noted Kannada poet and playwright H S Shivaprakash was presented with the Kusumagraja Rashtriya Puraskar 2017. 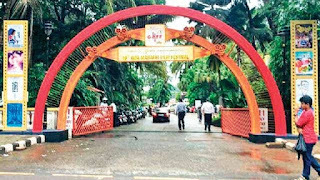 Maharashtra and Karnataka despite both states being at loggerheads over a border dispute. Kusumagraj, after whom the award is named, was a pen-name of Marathi litterateur V V Shirwadkar, a Jnanpith awardee. 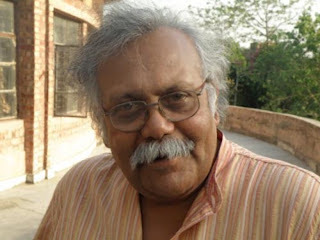 Shivaprakash, who writes in Kannada and English, has nine compilations of poems and 15 dramas. The award, constituted by Nashik-based Yashwantrao Chavan Maharashtra Open University's (YCMOU) Kusumagraja Adhyasan (Chair), carries a cash prize of Rs 1 lakh, a memento and citation. It was presented to Shivaprakash by Akshaykumar Kale, president, 90th Akhil Bharatiya Marathi Sahitya Sammelan. 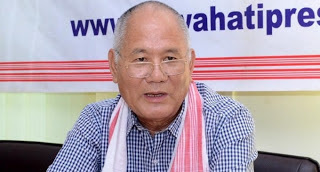 The Fifth Bhupen Hazarika National Award 2017 awarded to an eminent writer from Arunachal Pradesh Yeshe Dorjee Thongshi. This award is presented to honour whose outstanding literary work at National and International level. The award has been instituted by Sarhad, a Maharashtra-based organisation. His famous novel includes Mauna Onth Mukhar Hriday (Silent lips, murmuring hearts) which won the Sahitya Akademi award in 2005. Syama Sanju was declared the Queen of Dhwayah, the winner at Kerala's first ever beauty pageant for transgender women. 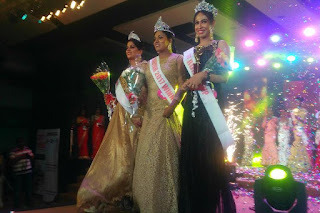 Jaz D'souza was crowned the first runner-up while Harini Chandana came third from among fifteen participants. Celebrities including Madhoo, Remya Nambeeshan and Pearle Maaney attended the pageant while former Miss World runners-up Parvathy Omanakuttan was one of the judges. Vučić said he would be giving Brnabić a mandate to form a new government—a decision that is unlikely to be contested in parliament, where the president’s Serbian Progressive Party maintains a firm majority. Although Brnabić is nonpartisan, she is considered loyal to Vučić. 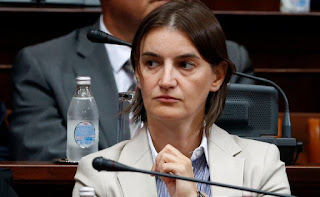 Brnabić’s lack of political experience also makes her an ideal choice for Vučić, who was reportedly keen on appointing someone to promote his own agenda. Indeed, Vučić is likely to remain the most powerful figure in Serbian politics, with Brnabić acquiring a more symbolic authority. 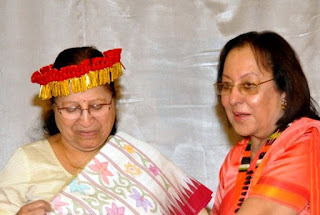 Former chief justice of India, Justice P.N. Bhagwati, passed away in the national capital. Bhagwati, who was India’s chief justice from July 1985 to December 1986 is widely credited with introducing public interest litigation (PIL) along with his brother justice V.R. Krishna Iyer. 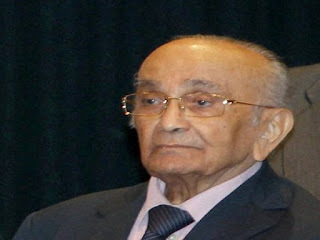 He was a judge of the Gujarat high court for 13 years and served as chief justice of the high court from 1967 to 1973. Subsequently, he was elevated to the apex court. After his retirement, Bhagwati held several key offices on judicial reforms and legal aid in Gujarat. He ran the Pilot Project of free Legal Aid and Advice in the state as chairman of the State Legal Aid Committee.